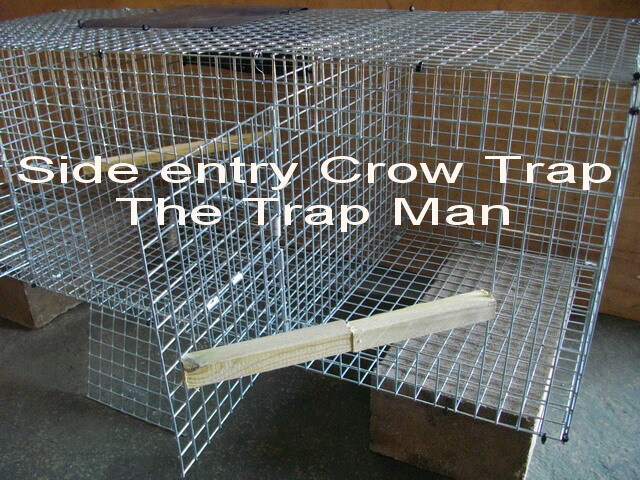 How to catch crows legally using a side entry twin capture metal Larsen cage trap. The important factor with a Larsen or Corvid trap is that it uses a live decoy bird. You MUST provide the decoy bird with food, water, shelter, a perch, enough room to stretch its wings and you MUST inspect the trap at least every day. In extremes of weather (heavy rain, snow, direct sunlight or wind) more protection should be used on the sides of the decoy cage. Most of the larsen traps have three compartments, one slightly larger than the others, and this larger compartment the decoy bird is kept in. The other two compartments have spring loaded doors which are held open by split perches, which are fitted to the base of the sprung door and across to the central partition thus holding the door open against the pressure of the spring. When the decoy attracts the other birds they drop on the split perch which gives way under their weight and the door is sprung closed entrapping the bird in the trap. 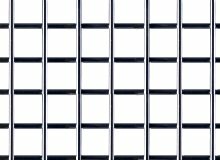 The traps can often be baited with eggs or egg shells placed on top or inside the compartments, although in the case of magpies it is the presence of an intruder (i.e.. The decoy bird) which attracts them. Any suitable bait such as meat scraps, small dead animals, offal, etc., may be used to bring magpies into a given area. The importance of choosing a proper bait location and the use of baits for several days prior to the actual setting of the trap cannot be stressed too highly. Best results will be obtained if the trap has a "weathered" or old appearance, as magpies are suspicious of shiny material. Ascertain the best place for positioning the trap, preferably where magpies congregate or near their flyway. Place bait in a suitable location. Large bones, fat, dead rabbits or any frozen carcasses and offal may be used as bait. Place the trap in close proximity to the bait allowing birds to become accustomed to the trap. Leave bait and trap separate for one or two days until magpies accept the bait. Small amounts of bait should be placed in the entrance to entice birds to enter. A daily check should be made near evening and any trapped birds disposed of humanely. If trapping is successful, one or two live magpies may be left in trap overnight to act as decoys. If, after several days, no results are obtained, the trap should be moved to a new location and repeated. Larsen traps are best set during the run-up to the breeding season. and exploits the magpie's strong territorial urges. A live magpie placed in the largest compartment acts as a decoy, while the doors to the smaller chambers are propped open with collapsible perch triggers and baited with an egg or carrion. Incensed by the sight of a stranger, neighboring magpies come to investigate. They are caught when their attention switches to the food.